Read Manchester has teamed up with charity Read for Good to host the city’s first-ever mass Readathon, which will bring the power of stories to Royal Manchester Children’s Hospital. Read for Good has been running its Readathon in individual schools since 1984. 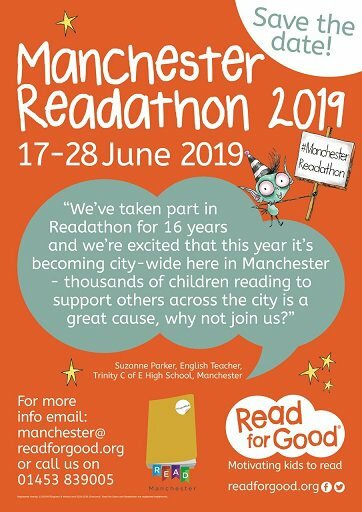 The Manchester City Readathon will run for two weeks from Monday 17 June to Friday 28 June with more than 85,000 pupils in around 195 schools invited to join the sponsored read. The project will culminate in a citywide DEAR (Drop Everything and Read) on the final day, which will be open to community groups and businesses too. Children taking part in the event will be sponsored to read whatever they like, with the emphasis on reading what they love. Money raised will be used locally by school libraries, on literacy projects in the city and fund Read for Good’s unique programme at Royal Manchester Children’s Hospital. "I’m delighted to support the 2019 Manchester Readathon in our great city, a city of so many amazing writers, poets and artists of all kinds. Books and libraries are a gateways to a brighter future for our children and it’s vital that we ensure that the benefits they deliver – literacy, empathy, knowledge, creativity and many more – are available to all, regardless of their circumstances. Through my own work in schools, plus visiting Royal Manchester Children's Hospital with Read for Good, I’ve been privileged to see the great benefits that Readathon delivers and I’d encourage everyone to take part and support this fun and important project in any way that you can." "We’re delighted to team up with Read for Good as part of Read Manchester’s city-wide Readathon. Our research shows that reading for enjoyment can have an important impact on children’s school attainment as well as their mental wellbeing. Readathon provides children with a purpose to read and allows them the freedom to choose whatever they want. We encourage all schools in Manchester to get involved with this brilliant initiative and raise money for a worthy cause." To sign-up to the Manchester Readathon, visit the Read for Good website..
Download the Manchester Readathon flyer.